On Sunday we counted 122 eagles between elated interceptions and abysmal kick recoveries for packer fans. Thank you not only for braving the cool weather but also for committing 45 volunteer hours when many of you would rather have been watching the game on a comfortable, warm sofa. 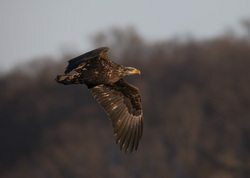 Eagles have clearly shifted back down river with the recent warm weather – decreases in numbers of eagles using Ferry Bluff, Blackhawk and Sugarloaf roosts and a corresponding dramatic increase at Lone Rock were seen (Table 1). We also likely missed eagles that used non-traditional roosts in the warm weather we had so the real count may have been higher (150-170 eagles?). In other words, our count is probably very similar to the previous three counts but perhaps a little higher, if you account for birds not using traditional roosts. Perhaps we will get a better insight into this total during our next count on February 1.